Feathers in Flight supports the beautiful birds in numerous ways. Consider yourself a condor buff? 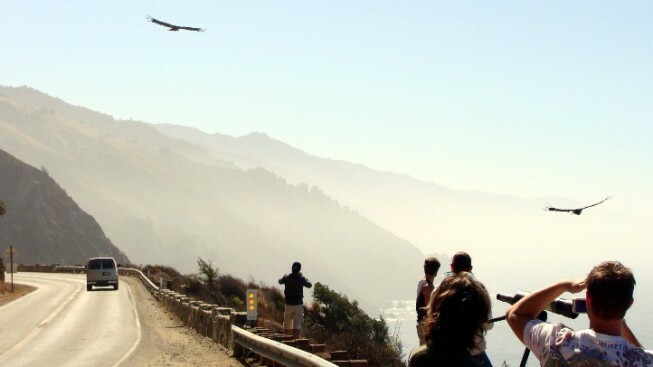 Be in Big Sur for a yearly fundraiser on Saturday, Oct. 8. FEATHERS IN FLIGHT... comes in, the annual Ventana Wildlife Society condor fundraiser. It alights on the nearest branch — or, rather, at Rancho Grande in Big Sur — on Saturday, Oct. 8, with a live auction, tunes played there, and views that could easily earn the handle "sweeping." The afternoon event also features "(u)nique condor-themed gifts," so if you're a maven of these mega vultures, you'll find a few items you may want to purchase. Tickets are $90 and the auction goodies are plentiful, including an overnight at Post Ranch Inn (that includes breakfast at Sierra Mar, a spot with huge windows and frequent condor sightings). Can't make the feathery fundraiser? Ventana Wildlife Society regularly leads tours to spots where these noble beasties congregate. Or, rather, spots where they might be observed, from a respectful distance. Your tour ticket, too, helps the arc of the condors' shared story, one that is still being told by those who work on their behalf, the birds' many fans, and, of course, the condors themselves.